July 4th is upon us again. This years Independence Day book selections are both lively and rich in heritage. Don’t be afraid to take a story-time break from all of the festivities—it might just be the thing that gets you and your family all the way through to the fireworks! Imogene loves history. So much so, she quotes famous people (Davy Crockett, Abraham Lincoln, Eleanor Roosevelt—to name just a few) and has been doing this since she was a baby. These famous quotes help carry the story of Imogene’s discovery of an abandoned Historical Society building in her quiet, New Hampshire based town. She takes it upon herself to clean up and restore this historic gem and open it up for tours. Unfortunately, no one comes. Then, the icing on the cake, she finds out that the building will be demolished and replaced with a shoelace factory— a factory, that according to the town’s people, will put them on the map. Just when things look bleak, she discovers a letter written by George Washington that states that he had slept in the very building that was about to be torn down. 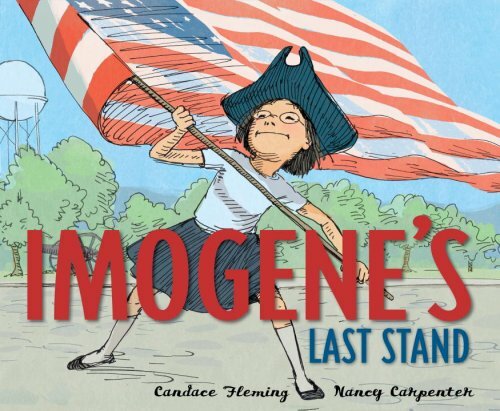 The story peaks with self-reliance and perseverance as Imogene notifies a historian and then takes her stand on the front porch of the building, blocking the way of the wrecking trucks. The town’s people end up joining the crusade and the historian turns up with the President—who happens to be depicted as an African-American woman—and Imogene gets to save the building. Candace Fleming has written a clever and engaging story that will appeal to both boys and girls. And, I have to say, it’s always a pleasure to read books that showcase girls with a strong sense of self. The illustrations, which are rendered in pen-and-ink and digital media, really add an authentic tone to the story—as well as a touch of humor. It’s really a great, little, history-lesson conversation starter. Different facts will interest different kids depending on their age and the previous introductions they’ve had to history; however, putting aside the historical emphasis, it’s an engaging and entertaining story. This selection is all about energy and vibe. Using dance, author M. P. Hueston bands the people of the United States together. Each mentioned state has its own special and unique dance which is described through rhyming text and characterized with vibrant and upbeat watercolor illustrations. 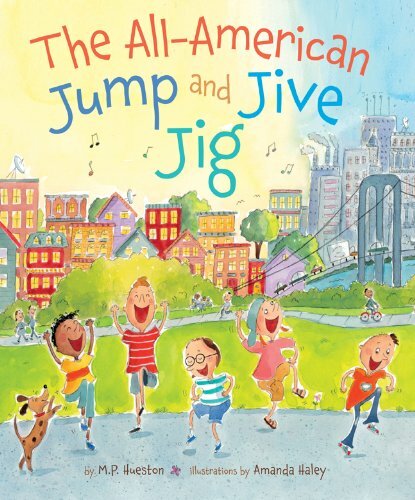 The All-American Jump and Jive Jig embraces differences and shows that although we are all unique we are also all one. An effective delivery of an important message, and a great book for an up-lifting and full-of-life story session—kids will be jumping, jiving, wriggling and giggling! A dance for each state? Sounds like a blast! Not every state is listed. But the ones that are have very fun dances—sure to get a giggle!